Digging in old photos I found three pictures of my father, grandfather and great-grandfather, all wearing military or military-style clothing. I took a picture of myself in my favorite NYPD-style jacket and created this list of four generations of my family. Notice the three repeating familiy names (reflected in first names and patronymics)– Mihail/Michael, Yakov/Jack, and Zinoviy/Zalman. 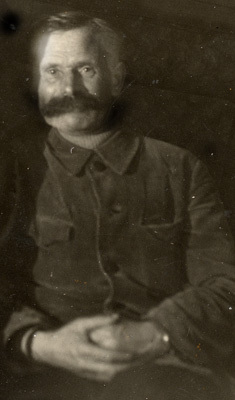 Zalman Mihailovich Krakovskiy, my great-grandfather, civilian, in his late forties. 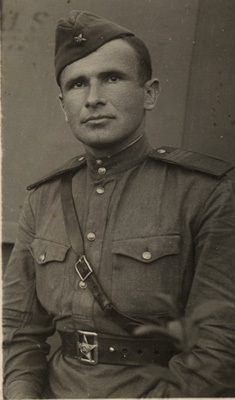 Yakov Zalmanovich Krakovskiy, my grandfather, Senior Sergeant, Red Army, in his thirties. The picture seems to be taken in front of some crates of Lend-Lease equipment in 1943. 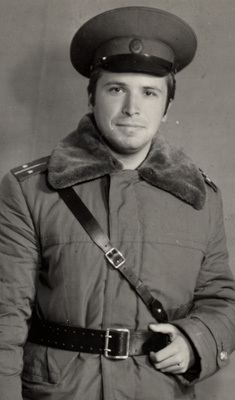 Zinoviy Yakovlevich Krakovskiy, my father, Lieutenant, Soviet Army, in his late twenties. 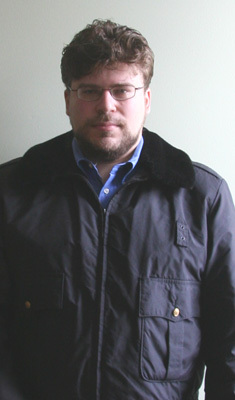 Michael Zinovievich Krakovskiy, myself, civilian, almost 30.